• Used to pierce the cortical bone initially. • Each drill has depth marking lines from 7.0mm to 15.0mm. • The dual marking system(grooves and laser markings) provides visual and radiographic depth verification during surgery. • TiN coating on drills : Enhanced corrosion resist- ance and abrasion resistance. • Used to remove and shape cortical bone to control initial stability in dense bone (type I & II). • TiN coating on drills : Enhanced corrosion resistance and abrasion resistance. • No more than 35Ncm torque : May distorted when excessive force is applied. 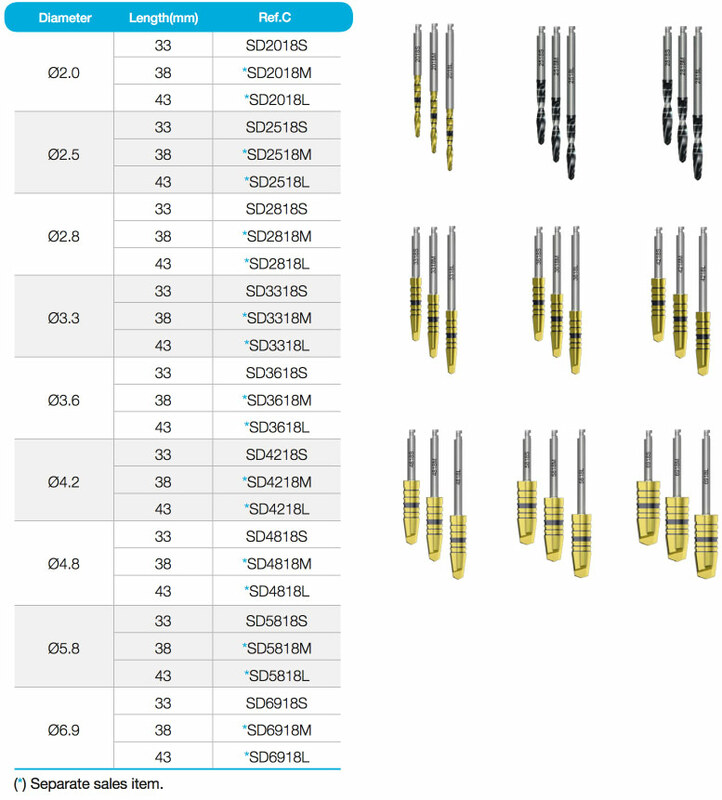 • Extends drills & other handpiece instruments. • Used with Handpiece to remove fixture from ampule and to place the fixture. • Spring type connection allows for easy and secure pick-up and positioning of the fixture. • First mark on the shaft indicate the position of the fixture platform, For second mark, the bottom of the black line is 3mm and the top of the black line is 4mm(from fixture platform). • Used for inserting or removing a fixture with the Ratchet Wrench. • Check to make sure the Ratchet Connector is completely seated into the Ratchet Wrench before using. • Excessive force can cause damage to internal hex of fixture. • Marks on the shaft indicate the position of fixture platform. Bottom of the black line is 3mm and top of black line is 4mm(from fixture platform). • Especially useful in flapless surgery. • Confirms drilling direction and functions as a parallel guide for additional osteotomies. • After the fixture is placed, a Path Finder may be con- nected into the fixture and function as a parallel guide for additional osteotomies. • Grooves indicate the distance from the fixture platform.The first groove is 0.3mm and the second groove is 1mm, especially useful in flapless surgery.